If you were on the receiving end of a manual action warning for unnatural outbound links this weekend, if your strategy to fix the problem was to nofollow every link on the site, you may want to rethink that strategy for a number of reasons. This is also something I brought up in my initial article all about the Unnatural Outbound Link Manual Actions published Monday, detailing everything important about these manual actions. First, Google is not recommending nofollowing all the links on a site as a way to see this manual action lifted. In one of the many threads in the Webmaster Help Forums about these new manual actions, John Mueller did advise that bloggers shouldn’t nofollow all links on the site. Here is what he said specifically this aspect of the nofollow. There’s absolutely no need to nofollow every link on your site! So this isn’t needed in order to be able to clean up the problematic links and submit a reconsideration request. It is understandable why some bloggers – especially those with larger sites or those without the time necessary to go through a blog link-by-link – are opting to either nofollow all external links, or worse, nofollow ALL links, including internal ones. It is a quick fix, it means potentially submitting a reconsideration request much quicker, but it could have long term repercussions. First, those bloggers going the all nofollow strategy are preventing sites they link to naturally from benefiting from those links, meaning they could contribute to those sites losing rankings. While one link doesn’t seem like much, across dozens or hundreds of blogs, it definitely could hurt rankings for those sites. Second, applying nofollow on all internal links on a site can make it harder for Google to recognize which pages are most important on a site, something that can certainly affect rankings and Google’s ability to surface the those top pages in the search results. Nofollowing all internal links is a horrible idea for SEO. So it is definitely a better strategy to nofollow links that should be nofollowed, such as product reviews you received compensation for, rather than nofollowing everything. if you are using wordpress, there are quite few plugins which will no follow only external links and/or you can also specify any other site(s) you do not want no follow as well. 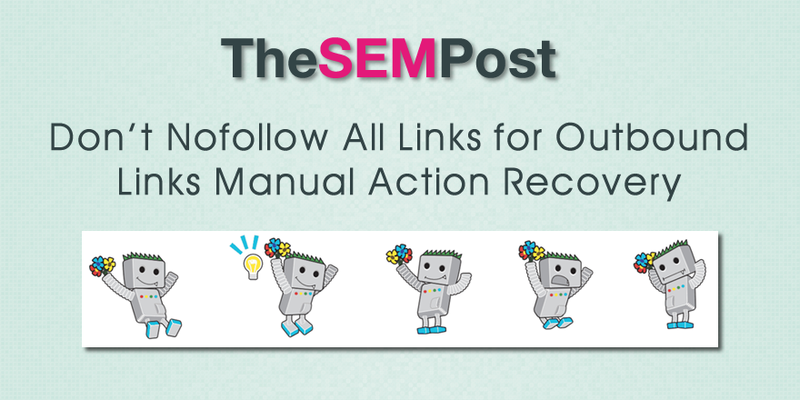 The manual action isn’t about nofollowing every external link. You just should nofollow external links, which have been put in return for money or a product / service.